India, the land of unique traditions and festivals, is all set to host Cheti Chand, which is also known as the Sindhi New Year. 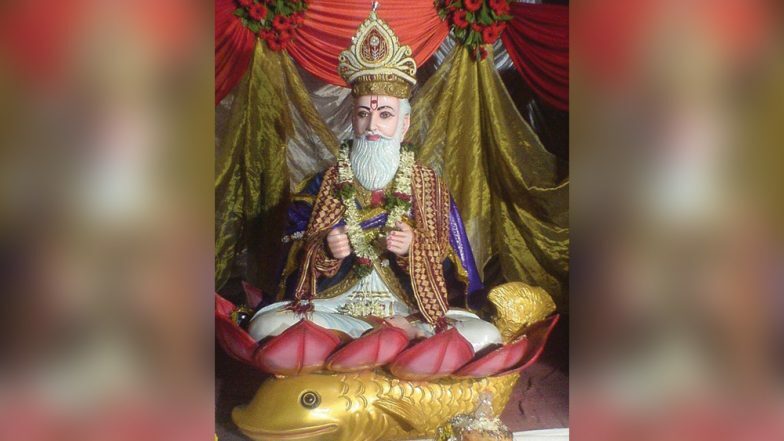 The day is celebrated in memory of Sindhi Patron Saint Jhulelal (most-revered deity) who was born on Cheti Chand. Therefore, the auspicious day is also known as Jhulelal Jayanti, and it marks the arrival of spring. There are different versions of the origin, history and significance of the festival. Cheti Chand 2019 will be observed on April 7. Here is everything you should know about the Sindhi New Year and Jhulelal Jayanti celebrated with much enthusiasm. Chaitra Navratri to Gudi Padwa to Rama Navami, Know All Important Dates and List of Hindu Fasts for April. In Sindh, one of the four provinces of Pakistan, Cheti Chand is celebrated in a big way with members of the Sindhi community. Both Hindus and Muslims don elegant clothes and join the grand Jhulelal procession. The festivity is followed by a cultural programme and langarsaab, free prasad for all. WhatsApp Stickers, SMS, Durga Devi Photos, GIF Images and Messages to Send Happy Navratri Greetings. The date for Cheti Chand everywhere is based on the lunar cycle of the lunisolar Hindu calendar. Usually, Sindhi New Year falls in late March or early April in the Gregorian calendar on or about the same day as Gudi Padwa in Maharashtra and Ugadi, celebrated in other parts of India. According to Drik Panchang, Cheti Chand 2019 will be celebrated on April 7. The dwitiya tithi begins at 03:23 pm on April 6 and ends at 04:01 pm on April 7, 2019. Cheti Chand is celebrated by Sindhis in not only India also Pakistan. People belonging to the Sindhi community celebrates the festival of Cheti Chand 2019 to commemorate the birth anniversary of Ishta Deva Uderolal, Jhulelal, the patron saint of Sindhis. Although, the exact year of birth of Saint Jhulelal is unknown, legends say that he was born during the 10th century in Sindh. It was the time when Sindh came under the rule of Sumras, who were tolerant of all other religions. Chaitra Sukladi Celebrations and Customs Associated With the Hindu New Year. A tyrant named Mirkshah was threatening the Sindhi Hindus to either convert to Islam or face death. People began to pray the river god to protect them from the forced conversion. As per legends, their prayers were heard after forty days of worship. The river god promised them that the divine child would be born in Nasarpur to save them from the cruel ruler. The child grew up to be Saint Jhulelal who eventually freed his people from the evil king. This is why on Cheti Chand 2019, people worship the water god, who is the elixir of life. Cheti Chand is celebrated with much enthusiasm across the Sindhi communities. People prepare delicious traditional food during Sindhi New Year. They also make a symbolic representation of God Jhulelal in their household, which is known as Baharana Sahib. For 40 days they worship the lord and offer prasad and sing aarti to Baharana Sahib. Besides this, the Sindhi community come out in a festive gathering where they sing and dance to their folk tunes in front of idols of Jhulelal.